Maunakea Scholars from Nanakuli and Kapolei high shools interviewed live on KHNL’s Sunrise program. Since its inception in 2015, the Maunakea Scholars program has seen tremendous growth and interest around the state, doubling each year in size. During the 2017/18 school year about 1/4 of the public high schools across Hawai‘i will participate in the program, with the goal of offering this incredible opportunity on every island in the near future. 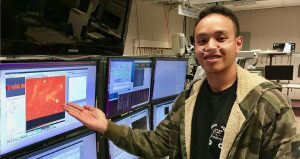 With hundreds of students participating in the program each school year, Maunakea Scholars pursue research in a discovery horizon stretching billions of light years into space. To date students have used the powerful telescopes on Maunakea to explore black holes, exoplanets, comets, and search for signs of life. This incredible program is unique to Hawai‘i and helps provide Hawai‘i’s students with world-class educational experiences, helping ready them for the 21st century. Students who participate in the Maunakea Scholars program work with cutting-edge technology and the most advanced telescopes in the world to conduct research of their own design. Students work alongside skilled astronomy mentors to create sophisticated proposals and compete for telescope time.